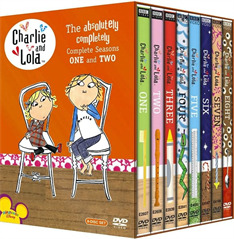 Now together in one super amazingly terrific box set, the absolutely completely completest collection of Charlie and Lola ever -- the complete seasons one and two, fifty-two episodes plus the double-length Christmas special, on eight discs! Lola is four and she will not ever never eat a tomato! Sometimes she is not sleepy and she will not go to bed, and how will she cope when she is really everso ill and may never smile again? It falls to big brother Charlie to win her around, and he uses every trick in the book -- logic, humor, but mostly, the power of the imagination. Charlie and Lola are the newest kids to start a craze among little nieces and nephews. They are brother and sister, and remarkably funny.